Dizzy’s Coca Cola Club at Jazz at Lincoln Center is one of the most special places in all of New York City. A jazz supper club located on one of the higher floors at the Time Warner Center at Columbus Circle, it’s an unmatched locale in which to enjoy some incredible Southern cuisine paired with the best jazz in New York City — all set against the backdrop of most stunning views of Central Park. So, it was a complete no-brainer that IVY had to pay Dizzy’s a visit for Fat Tuesday, the most extravagant celebration of music, spirit, and life. In preparation, IVY sat down with Alphonso Horne, who will be performing that night with the Gotham Kings. Horne dished on New Orleans, Dizzy’s and the connection between Mardi Gras and jazz. What was unique about the culture of New Orleans that made it possible for jazz to be born there? Historically, New Orleans was the largest port in the U.S., bringing people from all over the world to live in close quarters. Its long history — originally as a French colony, then taken over by the Spanish, then as a major global port, followed by the slave trade and African slaves in Congo Square — brought together a melding of people from across the globe. Jazz was born of all these cultures and traditions. As a result of the deep history, I believe New Orleans is one of the only places where music is deeply embedded in everyday life. In New York City, you go out to see music, and it’s often highly prepared and presented for the audience. In New Orleans, music is everywhere: the “party atmosphere” is always associated with New Orleans culture, and the audience is a part of the experience. The back-and-forth interaction with the audience is very important to a musician and is deeply ingrained in New Orleans life. What are some characteristics about New Orleans jazz that are different than other types of jazz? March music and ragtime were the very beginning sounds of jazz in New Orleans. As jazz traveled across the country, to cities like Chicago, St. Louis, Kansas City, and New York City, it continued to evolve and change. For example, in Chicago, a tuba was replaced with bass saxophone. Instead of being in the streets and in parades as in New Orleans, Chicago jazz was presented in dance halls and ballrooms, which changed the tone into a more “sweet” jazz. During the parade, you’ll hear something that was written in the 1800s and 1900s, but you’ll also Beyoncé and Louis Armstrong. But New Orleans jazz, no matter how sophisticated or virtuosic, has a deeply rooted folk element. It is common to see the youngest and oldest members of the community — from a five-year old to an 85-year old — who can both perhaps play the trumpet better than I can. That community and the core love of the music are what make New Orleans and its people so incredible. What was your first experience with hearing jazz? What drew you to it? My father was my first introduction to jazz. He is a musician and his mother was a music teacher. He and his siblings grew up playing the piano. He also played the trumpet in high school but later settled on to playing the piano and singing, which he still does now. I grew up listening to him. There was also always a trumpet around the house and I would blow into it. My father would say that I puffed my cheeks like Dizzy Gillespie, and we also had Dizzy’s records in the house that we’d listen to. So I chose to play the trumpet and started playing gigs with him when I was 12 or 13 years old. He’d write Miles Davis solos and the theme songs to I Love Lucy and The Flintstones, and I’d play them on the gigs. 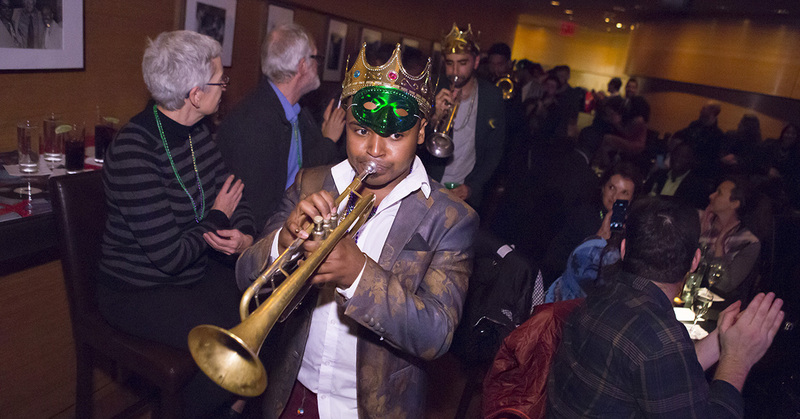 Why is jazz such a big part of the celebration of Mardi Gras? Historically, carnival music was more dances and waltzes. There is a song that the Gotham Kings will play next week titled “High Society” that is more march music that we adapted into a more party New Orleans vibe. 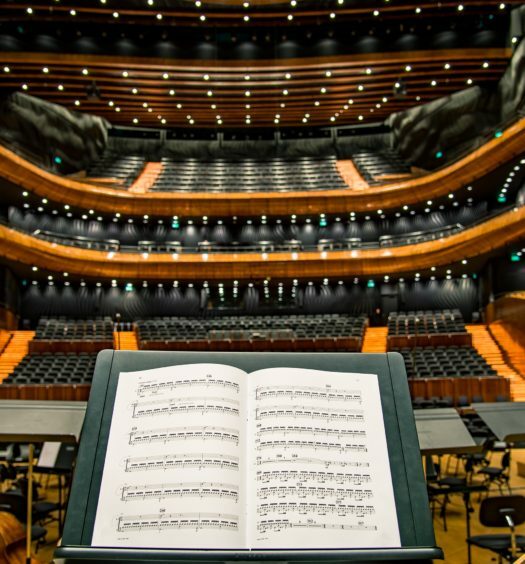 In the early- to mid-1800s, march and opera music was popular. Over time, with Afro-Caribbean influences, ragtime started to add “flavor” into it. 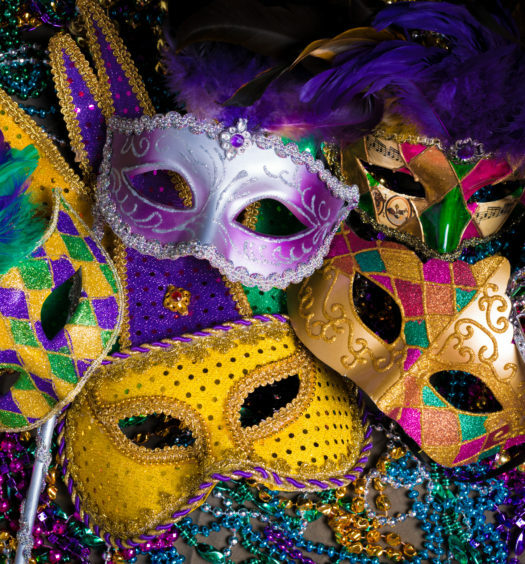 In the 1920s and 30s, people started to associate jazz with Mardi Gras. I believe jazz is a big part of Mardi Gras due to its history of parades and the music in New Orleans. For example, in Philadelphia or New York, you’ll hear really modern and avant-garde jazz. In New Orleans, you hear the history embedded in everything you see and hear, even if you hear avant-garde or modern music. And there are people of all generations dancing, playing, and celebrating music from hundreds of years ago. This music was born was in the streets, in dance clubs, out of the hardships and experiences of the people. The way people listen and dance to EDM now, people did that to jazz in the early 1900s. That element in jazz is still alive. That’s what I think is important about New Orleans and Mardi Gras: during the parade, you’ll hear something that was written in the 1800s and 1900s, but you’ll also Beyoncé and Louis Armstrong. The oldest and the most progressive — it’s all connected, it’s all a continuum. What is so special about combining food and music at a venue like Dizzy’s? How is this Fat Tuesday going to be special? In New Orleans, it isn’t just the music — it’s the food, the language, the way people dance and speak. Jazz is like gumbo: you add all the flavors and spices to the roux. Because of that, food and jazz are related. If you’re going to be having a jazz celebration, you want to be eating and dancing. I hope everyone in the audience next week will be dancing — we’re planning on having a party! 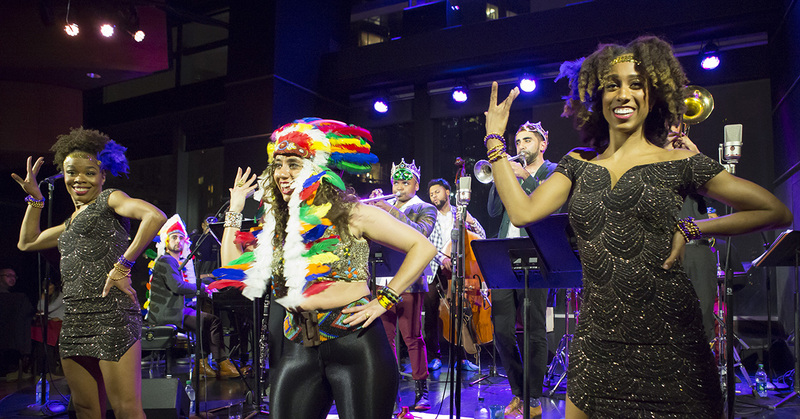 This will be my third year in a row doing the Mardi Gras celebration at Dizzy’s Club Coca-Cola. I’ll actually be there all week with Late Night Sessions and a Late Night Dance Party. 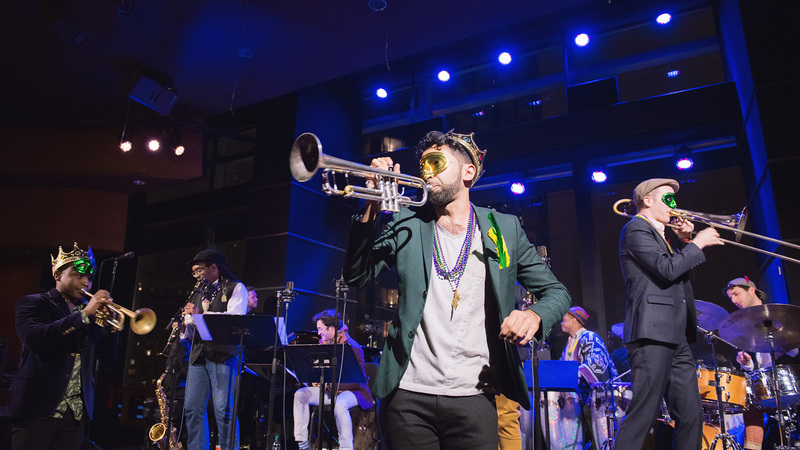 The Gotham Kings is a big team and it’s more of a theatrical experience; the show is meant to feel like a musical. My goal is to be immersive, with a narrator explaining each section, a large band, and even dancers. I want people to see and feel all the emotions you might feel if you were in New Orleans for Mardi Gras. You can only achieve that at Dizzy’s thanks to the environment, and the incredible New Orleans-inspired menu of food and drink. 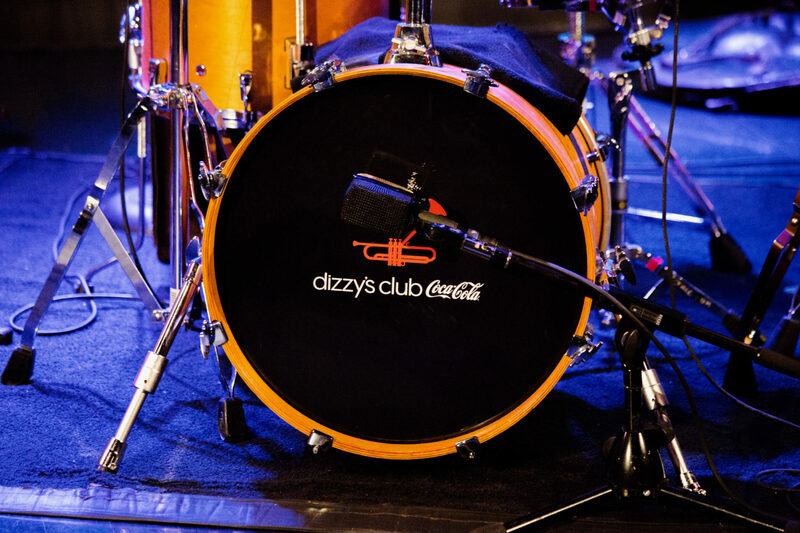 Dizzy’s Club Coca-Cola is very special to me. I’ve been there since I moved to New York City to attend Juilliard. After a week in Juilliard, I was playing with the Jazz at Lincoln Center Orchestra, playing with Wes Anderson, subbing for Wynton Marsalis, Managing and Artistic Director of Jazz at Lincoln Center (JALC) – it’s really a home for me. The staff is incredibly welcoming and amazing. When I bring friends and family to Dizzy’s for their first time, they’re in awe of how beautiful the space is and how great the sound is. 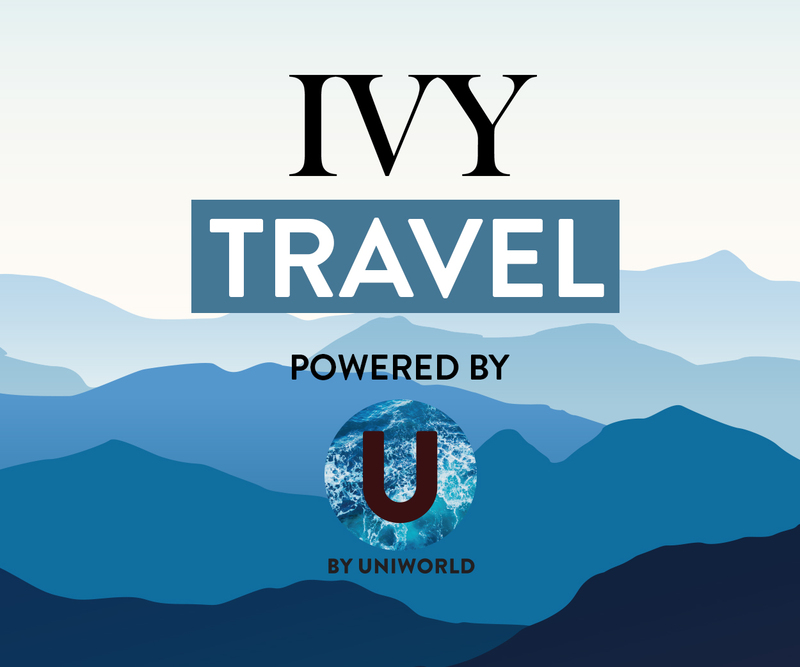 It’s an experience at the highest level, not just in New York City but in the whole world – you can’t find another venue that is so specifically designed to deliver the best performance and sound for the audience. The food and drinks, and really the staff – they’re all like family to me. Wynton is from New Orleans so any show you go to at Dizzy’s or Rose Theater or The Appel Room at JALC is going to have a deep cultural integrity to it. It’s going to have the cultural institutional element – you’re a part of the music, not just watching. What would you want someone who doesn’t really “get” jazz to know in order to deepen their appreciation for it? Jazz is a people’s music. A lot of people are intimidated by it – they feel that it is detached or elitist, that they have to educate themselves in order to get it. That is not my goal at all. I want people who don’t know anything about jazz to appreciate what’s going on onstage. For a listener who doesn’t get jazz, the important thing to know is that it is music for the people. This music was born was in the streets, in dance clubs, out of the hardships and experiences of the people. The way people listen and dance to EDM now, people did that to jazz in the early 1900s. That element in jazz is still alive. For example, when you watch a foreign language film without any subtitles, you may not understand what is being said but you can feel the emotion – you understand and get what they’re trying to convey. It is the same with jazz: you might not understand the vocabulary or the language, but it’s evoking a language everyone can feel. What does being a “creative person” mean to you? What advice would you have for someone who wants to be more creative? My fundamental belief is that we are all creators. It’s not a question if you are creative or not. When we were younger, we may have had invisible friends or loved drawing and dancing. That inner child is always with us. Through time, as we grow up, we become more domesticated. We learn the dogmas and the rules, how to function in society and be a responsible citizen. In that process, sometimes we forget that inner child that likes to play and create. Our role as people, regardless of our profession, is to help create a movement, growth, and evolution in human society. That part of us is always there. It’s all about continuing to stay in touch with that inner child that allows us to be free to be creative.